BATESVILLE—Benedictine Mother Dolores Hart said that she receives many letters daily at the Abbey of Regina Laudis in Bethlehem, Conn., each requesting her to come speak at a different location. Most she must turn down, but when a letter from Father Stanley Pondo, pastor of St. Louis Parish in Batesville arrived on her desk, it touched her heart. “I felt this absolute piercing sense of, ‘Oh my gosh, I can’t refuse him,’ ” she told the crowd gathered at the parish on Sept. 30. “Maybe you’ve had the same experience?” she concluded, as the priest’s parishioners erupted into laughter. More than 250 parishioners, community members and youths packed the pews to hear directly from this former Hollywood star who left the silver screen at the height of her career to become a cloistered nun. Father Pondo had persuaded Mother Dolores to fly to Indiana because he was convinced that her story would help the youths, especially, understand that a relationship with God is the most important thing in life. Mother Dolores was only 19 when she became an overnight success story. She landed a starring role in Elvis Presley’s 1957 film, Loving You, complete with a seven-year contract with Hollywood’s Paramount Pictures. During her second film with the cultural icon, she recounted that the two of them had to wait in a hotel room between scenes so that Presley was hidden from the ever-present crowds. Presley found a Gideon Bible in the room and asked the young Hart to flip to a random page, read the passage and share what it meant to her. He then did the same. Mother Dolores attributed his interest in the Bible to his love and respect for his mother, Gladys Presley. She herself was being prepared by God for her own vocation, even as her fame continued to grow. She explained that her friend, Don Robinson, proposed marriage to her, which triggered an immediate questioning of her future. During a hectic time as a lead in Broadway’s The Pleasure of His Company, a friend suggested that she take a retreat at the Abbey of Regina Laudis which was located a short distance north of New York City. From the moment Mother Dolores arrived, she knew that she had found where she belonged. In 1963, at the age of 24, Mother Dolores broke off her contract and engagement, gave away everything she owned and entered the abbey. In 2012, her incredible story was recounted in an Oscar-nominated short subject documentary, God is the Bigger Elvis. “She’s just an amazing woman, and she makes me cry,” said Grace Eckstein, a student at Batesville High School and a member of the St. Louis Parish youth group. She had watched the documentary with other youth group members in the weeks leading up to the nun’s visit. As her pastor predicted, Grace came away from the talk with new priorities. 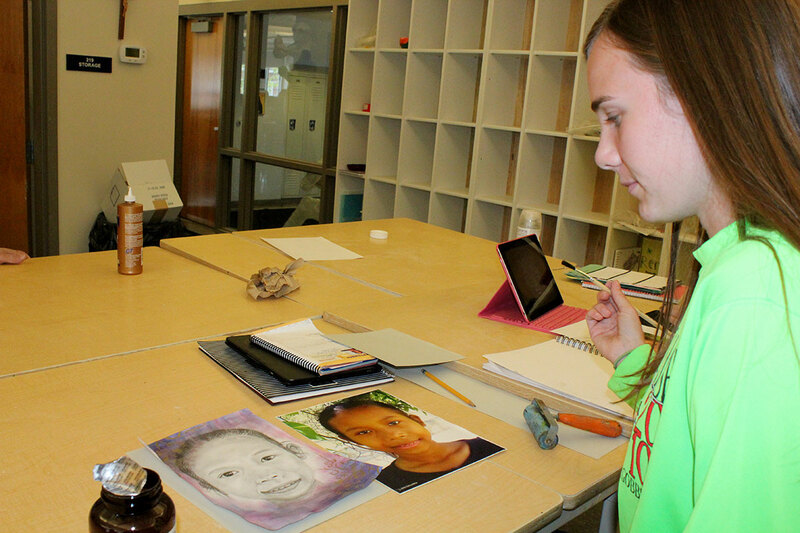 “Just discerning my vocation, it’s not about what I want, it’s about what God wants,” she said. “I learned to just trust God because it was obviously a radical decision to quit Hollywood and become a sister,” explained fellow youth group member Adam Moster. Mother Dolores’s decision to leave everything behind for the sake of her vocation especially resonated with him: Adam said he is considering the priesthood. “I think it’s a lot of prayer and trusting in God and hoping that he has a plan for you that’s better than your own,” he said. 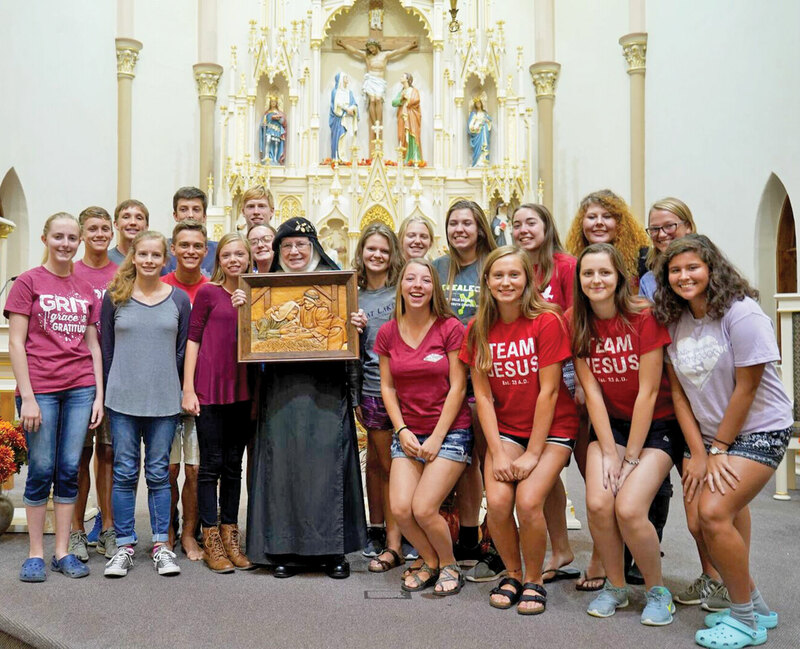 The evening before her speech, the youth group and other parishioners had the opportunity to meet Mother Dolores one-on-one. 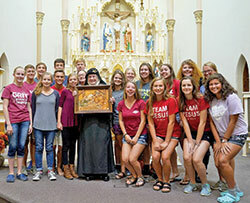 Youth group member Erin Batta recounted that Mother Dolores listened attentively to each person and offered specific advice for each situation. “She didn’t just say generic things like, ‘Remember God loves you,’ and stuff like that, but she would ask you about your life and then specifically give advice on what you said,” Erin said. During the meet-and-greet, St. Louis parishioner Dave Meyer noticed a unique feature of Mother Dolores’s dress: atop her veil, she wore a black beret decorated with small pins. In his pocket, Meyer happened to have a small cross pin, an extra from a recent parish mission trip. Father Pondo and the youth group also presented Mother Dolores with another special “thank you” gift: a large image of the Holy Family created by the local Weberding’s Carving Shop. Mother Dolores praised the small town for its “simplicity and love,” and encouraged her listeners to continue living as a loving community. Asked by an audience member about her favorite saint, she gave the Batesville parish one last burst of pride. The parishioners gave their approval with a hearty laugh and resounding applause.